David Intercontinental Hotel offers a superb location for ISRANALYTICA 2012. 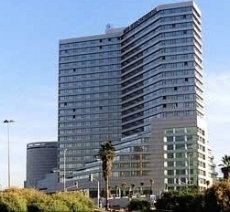 The hotel is situated within walking distance of the Tel Aviv beach overlooking the Mediterranean Sea and is close to many cultural and financial centers. Its proximity to the beach and major centers in Tel- Aviv enable the participants to enjoy its surroundings. Climate: The weather in Tel Aviv in February is cool and pleasant during the day and cooler in the evenings. Temperatures range from 10 ° to 20 °C, and rain is possible. Clothing: Informal for all occasions. During the first day of the conference (January 24th, 2012) a general assembly of the Israel Analytical Chemistry Society will take place. This assembly will include a discussion about issues related to the society and decisions regarding its activities. Any changes to this date will be published on the scientific program page; please check closer to the conference dates. Upon registration to the conference you will receive your conference kit containing the printed material of the conference, name tag and voucher for lunch. This is valid for conference registrants only; visitors to the exhibition will receive a name tag. Please wear your name tag to all sessions and social events. Ben Gurion International Airport is the main international gateway to and from Israel. It is situated approximately 25km (16 miles) south-east of Tel Aviv. The journey to Tel Aviv is approximately 30 minutes. Train tickets can be purchased through automated ticket dispensers on Level G of the terminal. 03-6117000 or *5770 from any cellular phone. The Taxi companies at Ben Gurion Airport operate under supervision of the Israel Airports Authority. This is a non-smoking event. Kindly use the hotel designated smoking areas only.